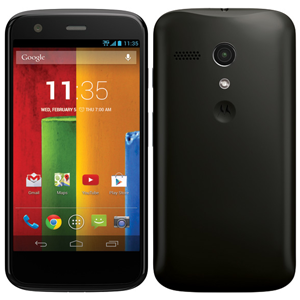 The Moto G is an Android-powered mobile phone sold unlocked through the Google Play store at an affordable price. It's available with either 8 or 16GB of storage, and promises all-day battery life with a 2070mAh battery. Many claim the Moto G to have fantastic performance, thanks to its lack of heavy UI, and also its quad-core Snapdragon 400 CPU and 1GB of RAM. The Moto G is also quite lightweight thanks to its modestly-sized 4.5" 1280x720 HD display, weighing in at just 143 grams. It originally shipped with Android 4.3 Jelly Bean, but has since been upgraded to Android 4.4 KitKat, and is promised future updates directly from Google.